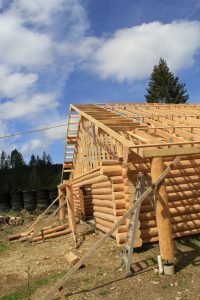 Since the last update on the Archery building there has been a beehive of activity onsite. A great deal of work has progressed on the building with all the trusses being installed and braced as per the engineers outline. 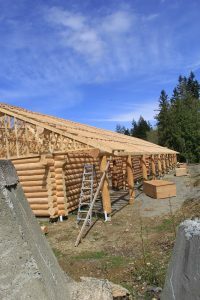 This job alone took a significant about of time with focused attention on the accuracy of the placement of each truss. 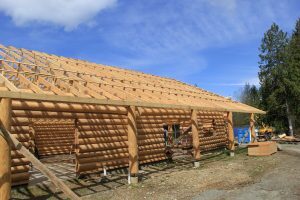 Attention to detail and time is required to ensure all the trusses are properly spaced, plumbed and securely braced to facilitate the application of the sheeting which is to follow. 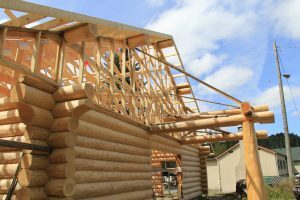 Once the trusses had been installed the false fascia was put in place, the gable ends framed to accept the sheeting, blocking for the installation of drywall on the interior of the structure and placing of the false purlins at each gable end. This is no small feat when one realizes that it has all been accomplished with volunteers and during one of the wettest Aprils on record. The month is not yet over and should anyone be around the NF&G property this week end you will see another crew working feverishly applying the sheeting to the roof. No easy task when one realizes there are in excess of 300 sheets of plywood to put down.